ComplianceOnline, the leading provider of compliance seminars, announces summit in September 2016 for medical device companies. 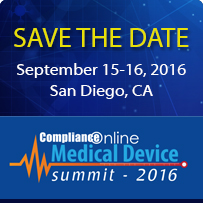 ComplianceOnline, the leading governance, risk and compliance advisory network with over 1,000 experts in various regulatory subjects will host medical device summit on September 15 and 16, 2016 in San Diego, CA. The two day summit steered by some of the world’s leading experts and former FDA office bearers will be one of the largest gatherings of medical device companies, suppliers, professionals and experts in 2016. This event will benefit all medical device professionals – whether they are new entrants in the field or middle management or veterans. Mark Faupel, CEO, Guided Therapeutics Inc.
Peter Pitts, Chief Regulatory Officer, Adherent Health, LLC. The event serve as an integrated platform for exclusive business opportunities for medical device companies – stalls will be available for organizations to exhibit their latest products and technological innovations. From a marketing and branding perspective too, the event will provide a conducive environment for both established as well as up-and-coming medical device companies and their suppliers. Early Bird Discounts: For discounts on early registrations, please click here. ComplianceOnline is a leading provider of regulatory compliance trainings for companies and professionals in regulated industries. ComplianceOnline has successfully trained over 45,000 professionals from 9,000 companies to comply with the requirements of regulatory agencies. ComplianceOnline is headquartered in Palo Alto, California and can be reached at http://www.complianceonline.com. ComplianceOnline is a MetricStream portal. MetricStream (http://www.metricstream.com/) is a market leader in enterprise-wide Governance, Risk, Compliance (GRC) and Quality Management Solutions for global corporations.